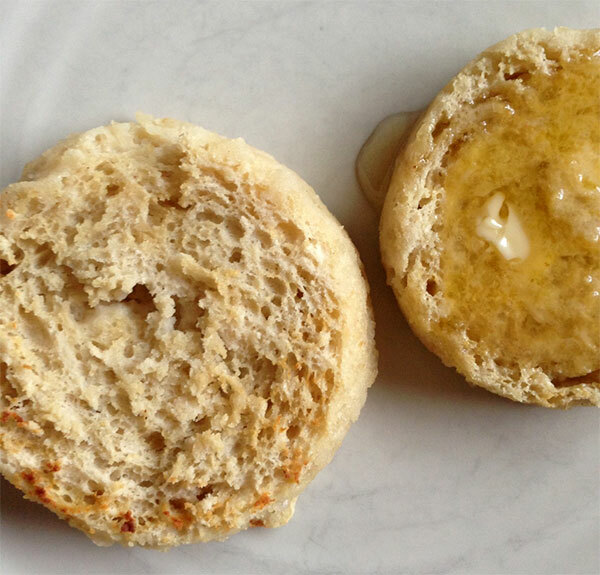 One of my most popular recent posts was on the subject of a Paleo “English muffin” recipe. Many people appreciated the option of a quick-cooking bread-like snack or meal item like this, but requested options that more closely resembled the chew and texture of a traditional nook-and-cranny English muffin. I’ve been playing with this as well, and would like to offer a new variant—perhaps not the last—for your consideration. Urad dal, also known as black gram or black lentil, is actually a tiny white bean with black skin that is prized in Indian cuisine, in which it is widely used in gluten-free recipes for idli, dosas, vada, and pappadum, most of which traditionally call for fermentation. It is very nutritious, being high in protein, potassium, calcium, iron, and B vitamins; it is also a decent source of essential fatty acids, containing 603mg of omega-3 and just 43mg of omega-6 in one cup of cooked beans. As with many beans, urad has prebiotic properties thanks to its high amylose content; the skinned varieties are also low in lectins and phytates. For baking purposes, cooked urad has a creamy mucilaginous texture that can act similar to gluten, trapping air bubbles for improved rise, even without the need for eggs as a binder; when fermented as a batter, it may not even require the aid of yeast or a chemical leavener like baking soda. Indian grocers will carry both whole or skinned and split urad, as well as a very finely ground urad flour; if you are concerned about gluten cross-contamination from processing, I suggest using the split skinned beans in your recipes; soak, cook, and grind them into a paste, and proceed from there. I haven’t tried this method yet in my own baking experiments, but will provide further updates when I do! Other variants I hope to try with this recipe include using the batter immediately with no soaking time, as well as extending the soaking time overnight in a warm atmosphere like my Excalibur dehydrator (which also works for maintaining a low steady heat for proofing yeasted doughs and making yogurt), perhaps with the addition of a bit of baker’s yeast for an effect more like sourdough bread. I am also hoping to experiment with a few other English muffin bases, including the use of seeds and psuedograins, as well as chestnut and water chestnut flours, so stay tuned and in the meantime, enjoy! This batter comes together in a snap and is grain-free, gluten-free, nut-free, dairy-free, and egg-free; due to its reliance on a type of bean flour, it would be considered primal rather than strict paleo. Combine urad flour, coconut flour, water and ACV in a small bowl; cover and set aside in a warm corner for at least 4 hours or overnight. After resting, add the honey, salt, and baking soda, and stir gently to combine. Divide batter between 6 1/2-cup greased ramekins and bake in a preheated 400F oven for 20-25 minutes. Split with a knife or fork and toast for optimal texture. Variants: Microwave English muffins in greased ramekins for about 60 seconds per ramekin; your mileage will vary depending on the wattage of the microwave, so be sure to do a tester. 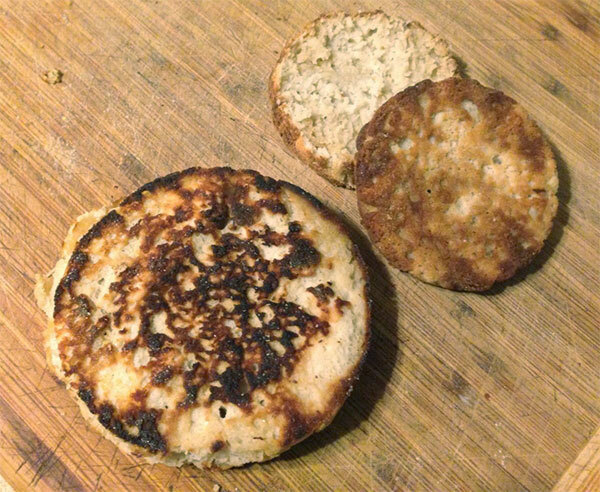 Use English muffin rings on a well-greased skillet to cook batter until golden brown on each side. Depending on how thick you spread the batter in the rings, you may need to transfer the English muffins to the oven for a few minutes to cook through in the center.